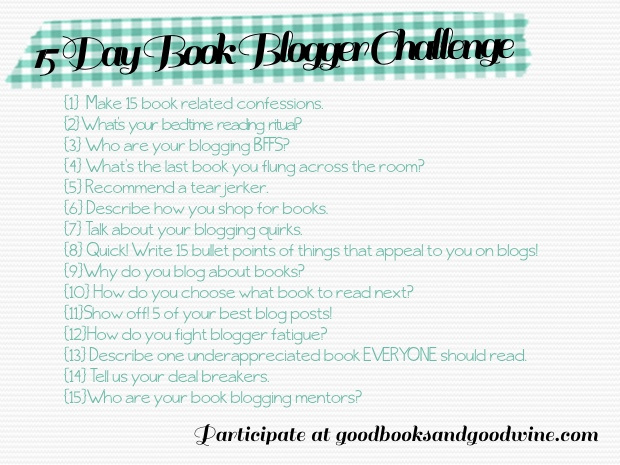 Despite being super busy, I am determined to follow through with my 15 Day Book Blogger Challenge (started by April at Good Books and Good Wine). Clean design -- it doesn't have to be super fancy, just easy to read and find things. Charismatic blogger. You know, seems friendly and helpful. Blogs with tips for other bloggers. I love the sharing of ideas. We're all in this together and there's no harm in sharing knowledge. A variety of posts -- not just reviews, but memes, blitzes, blog tours, etc. Quality content! It's so much more important than design and it should always be priority one. A variety of books -- I prefer mostly YA/NA blogs, but it's nice to see bloggers who review more than one genre within those. Recaps of events where bloggers go. I'm a new blogger, so I've only been to BEA, so I love reading about other events like San Diego Comic Con or ALA. It gives me an idea of where I'm heading. Blogs that offer blog tours. I've signed up for a bunch. I think it's a great way to really jump head first into blogging. Blogs that occasionally have something non-book related. I did a post when Cory Monteith died. Some blogs review music occasionally or talk about trips. It's nice to see other sides of bloggers' personalities. Blog rolls! If I love a particular blog, I love to see the others that they recommend. Odds are I'll love them, too! Blogs with more than one author. I don't know that I would ever do it, but I love the idea of it and it's fun to see two bloggers (or more) collaborating. Bloggers who don't just review the books that are upcoming and that have a release date, but books that they chose just for the sake of enjoyment. New bloggers! Books are a wonderful source of enjoyment and in the digital age, it's really nice to see that there are still people who would rather pick up a book (or even an e-reader) and read. Blogs with an easy to use mobile site. I know Blogger isn't great for that. But one blog that I LOVE that has an awesome mobile view is Nose Graze. Blogs by people who clearly love to read and love to review and aren't just in it for the free books. Up next on the challenge ... Why do I blog about books? 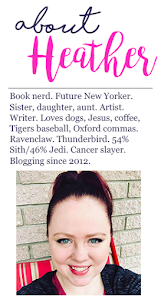 Found you on Book Blogs. I'm also a fan of YA/NA. New follower.